In recent weeks and even months, numerous celebrities have been called out for inadvertent (or at least many would label it thus) insensitivity to race and how we should be speaking about it. From Taylor Swift’s Twitter feud with Nicki Minaj—now resolved after Taylor admitted that she misunderstood the issue—to Miley Cyrus’s interview with The New York Times in which she implied that although speaking of race is important, people must be “polite” to do so (a classic demonstration of white fragility and tone policing), it seems the world has come to a point where it is willing and eager to call out celebrities for their mistakes, particularly when it comes to comments about race. I doubt very many people would argue that the public—and other celebrities—shouldn’t be calling out celebrities for making these errors. Even—especially—the stars who don’t recognize their errors and learn from the experience (like Kylie Jenner and her now-infamous cornrows or the blackface photoshoot, both acts that Jenner refuses to understand as instances of cultural appropriation or outright disrespect) must be held accountable for their comments and actions. 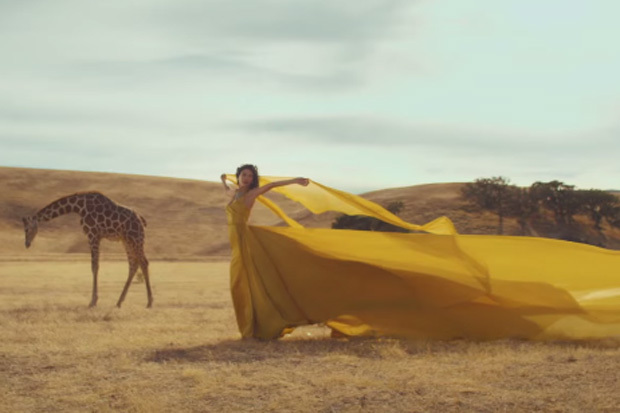 Therefore, in order to hold Taylor Swift accountable for her mistakes, there is something that must be said about the music video for her song “Wildest Dreams”, which premiered at the VMAs on August 30. The video, which takes place on the set of a 1950s movie about Africa, is about two white explorers, Swift and costar Scott Eastwood, falling in love while they are filming, and breaking up when they return to the real world and Swift discovers that Eastwood is married. For many, this plot is problematic from the get-go. Why was the video set in Africa? If Swift wanted that badly to incorporate the trope of co-stars-falling-in-love-on-set-but-breaking-up-because-of-real-life that badly, couldn’t she have chosen basically any movie plot other than one that would by its very nature be racially insensitive? A shot from the “Wildest Dreams” video. Photo courtesy of Google Images. The error lies in Swift’s positive intention to donate the money from the video to the African Parks Foundation. Without the video, “Wildest Dreams” is simply about a girl hoping that her lover will remember her once they’ve broken up. How do you connect a song about the fallout of an intense relationship to the African Parks Foundation? Evidently, the answer is 1950s Hollywood and the recreation of “classic Hollywood romances like Elizabeth Taylor and Richard Burton, as well as classic movies like The African Queen, Out of Africa and The English Patient, to name a few,” as director Joseph Kahn said in his defense of the video. Taylor with the director of “Wildest Dreams”, Joseph Kahn. (Photo courtesy of Google Images). Still, despite Kahn’s passionate defense of his work, his argument is not as well-reasoned as he might believe. Although Kahn is Asian, and therefore not white (a fact he mentions in his defense of the video in an attempt to increase his credibility), his defense of the film demonstrates one of the greatest problems in the racial discourse of America at this point in time: too many Americans, like Swift and her production crew, are utterly oblivious to their own place in the racial landscape of America because they are not directly affected by the institutionalized racism in this country. The fact that no one on the crew of the “Wildest Dreams” video saw a problem with its plot before the video was made reveals an ignorance so deeply ingrained in the American psyche that many are ignorant of their own racial ignorance and white privilege—the privilege to be oblivious in the first place. Taylor Swift made an error that was selfish; she did not think of her video as being involved with race at all—but how could it not be? Even though I believe that there was no intentional racism in the video, it doesn’t matter—and in fact, in a sense, the unintentional racial problems of the video might be worse, for how can you fix a problem that no one will acknowledge? Taylor’s error stemmed from positive intention, but that doesn’t make it any less an egregious error. Positive intentions are no excuse, and even though I am not a person of color and cannot claim authority on the experience that people of color do face in America, I must make this statement: Taylor, I’m not going to defend your video. I’m not going to protect your feelings. And no one else should, either.